We have been told by some members that because of these factors, reporting of incident data to a PSO is not viewed as a priority within their organization. Fortunately, many organizations understand that the identification of the causal factors of emerging safety risks identified by PSOs is a crucial component to improving the quality of health care delivery and eliminating preventable harm. After all, it’s hard to accomplish these improvements if you do not understand why they occur. 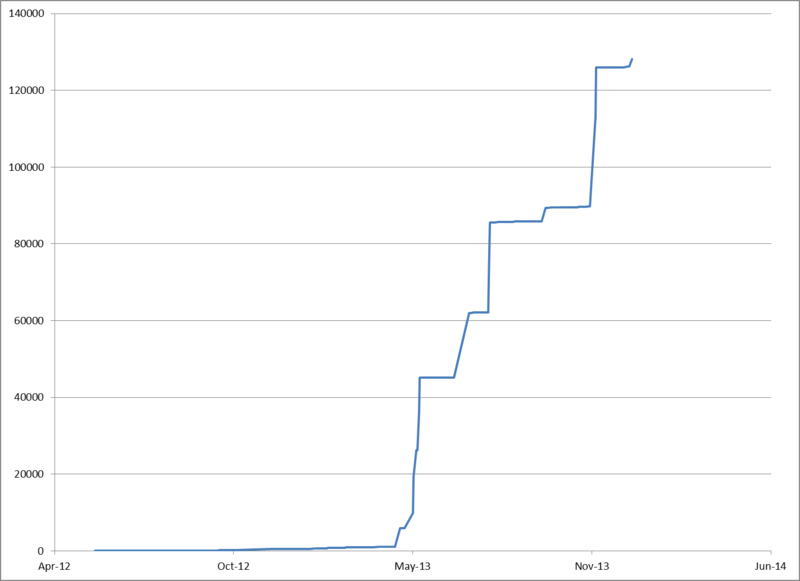 Due to this commitment, CHPSO has experienced a steep increase in data reporting (see Table 1 below). The database now contains approximately 132,000 incident reports which are rich in information. We are currently working on a couple of “deep dives” into safety incidents related to clinical alarms and bar code medication administration to better understand and share the leading causal factors behind incidents involving these technologies. Most of the organizations that are reporting large volumes of incident reports are able to do so through automated modules or services with their risk management incident system (RMIS). We encourage you to contact your RMIS vendor to discuss their ability to automate your incident data to CHPSO. When you are ready to start the process, contact us at CHPSO and we will walk you through the process. Case 1: A physician and nurse discussed a new patient’s medications. The nurse thought the doctor had requested alprazolam, but the BCMA system noted lorazepam. The nurse overrode the system and gave alprazolam, which was incorrect. Case 2: A physician and nurse discussed a new patient’s medications. The ensuing order was incorrectly transcribed by the pharmacist into the pharmacy system. This error was not caught by the BCMA system, which was fed the erroneous data from the pharmacy system. The nurse, looking at the medication, recognized that the physician had not ordered it, and caught the error. BCMA not working: e.g., bar code missing or unreadable, or bar code system down. Nurse believes that BCMA is providing wrong information, e.g., an earlier conversation with the physician indicated that a different medication was supposed to be given, or the nurse believed the dose to be incorrect. Add to these situations time pressures, such as when a medication is needed emergently, and you are then faced with a true test of the nurse’s surprise coping ability. Nurses face the unexpected regularly and are regularly addressing surprises that may evolve into incidents. Streamlining and mistake-proofing procedures are time-honored methods of improvement and can help reduce surprises. However, in complex adaptive systems such as health care delivery, predicting and thus mapping out all needed procedures to address all possible situations is, by definition, impossible. Over time, many nurses have developed “working knowledge” of what to do when faced with surprises—often with a workaround. However, when critical processes such as medication administration are revised and improved, the old ways of coping may not be applicable or may even make things worse. Surprises will continue to occur, and even the most sophisticated process improvement plan will not eradicate them. As part of any critical process revision, organizations should provide guidance and support for rapidly addressing surprises in a manner that doesn’t significantly compromise safety. If the organization does not provide practical simple guidance for dealing with these emergencies, nurses will be forced to problem-solve on their own, and may choose a less-than-optimal strategy. Fortunately, hospitals already have copious instances of successful problem-solving experience to draw upon: the near misses and unsafe conditions that did not evolve into an incident. In many of these near-events, a nurse successfully took action to protect the patient. Finding out what went right when things were going wrong can help a hospital develop recommended surprise coping strategies. That, combined with developing and testing fall-back procedures for BCMA system down-time can address many of the potential events. The field of resiliency engineering addresses the surprises (positive and negative) that regularly occur in complex systems. A good reference is Resilient Health Care, ISBN 1409469786, published September 2013. CHPSO will continue to evaluate BCMA incidents and provide further reports in the future. strategies to engage health care professionals through change management methodologies that foster a culture focused on patient safety and quality of care. Bob Conrad is Owner/CEO of R-Conrad Consulting, LLC, headquartered in Texas. His firm assists organizations in achieving revenue enhancement, cost reductions and improvement of quality through process improvement and change management methodologies. Nursing- Provider approved by the California Board of Registered Nursing, Provider #CEP 16084, for 1.0 contact hour. Full attendance, completion of online survey, and attestation of attendance is required to receive CE for this webinar. CE is complimentary for registrants. This call is for members only. Registration is required and available at http://www.chpso.org/form/february-member-call. A CHPSO website member account is required. Registrants will receive an email February 7 with participation information. Participants registering on or after February 7 should contact CHPSO for participation information at (916) 552-2600. The Office of the National Coordinator recently released the SAFER guides: a new set of guides and interactive tools to help health care providers use electronic health information technology products, such as electronic health records (EHRs), more safely. These guides are a suite of tools that include checklists and recommended practices designed to help health care providers and the organizations that support them assess and optimize the safety and safe use of EHRs. This call is for members only. Registration is required and available at http://www.chpso.org/form/february-chpso-ecri-webinar. A CHPSO website member account is required. Registrants will receive an email February 14 with participation information. Participants registering on or after February 14 should contact CHPSO for participation information at (916) 552-2600. Among other responsibilities, patient safety organizations are charged with assisting providers to develop a culture of safety. This is no small task. Culture is a simple word that encompasses the huge range of what is shared by members of a group, including assumptions, values, beliefs, norms, symbols, language, customs, rituals, behaviors, etc. As organizational size and complexity increase so too does culture. Moreover, culture is multi-layered. The visible espoused values and rules (what we say) are less powerful than the deeper, less conscious basic assumptions, meanings and norms at influencing what we actually do, particularly in times of crisis. While culture serves the basic human need for stability, it may be dysfunctional and filled with conflict and ambiguity. Culture is a product of the shared learning (cognitive, behavioral and emotional) of the organization and its component sub-groups. Among physicians and nurses in particular, culture is also influenced by professional norms that transcend organizational boundaries. For example, I have previously shared how the dysfunctional QA model for clinical peer review has persisted based on its history (http://www.qatoqi.com/nl09.htm). Many hospitals have sought to assess their safety culture using the Hospital Survey on Patient Safety Culture developed by AHRQ or similar instruments. AHRQ has maintained a comparative database of voluntarily reported survey results since 2006. The response has been excellent. Over 1,000 hospitals contributed data in each of the past two years. The results, however, are disappointing. As the attached figure shows, the composite category Non-Punitive Response to Error has consistently run at a very low 44 percent positive. The associated component survey items have the same flat-line trend. 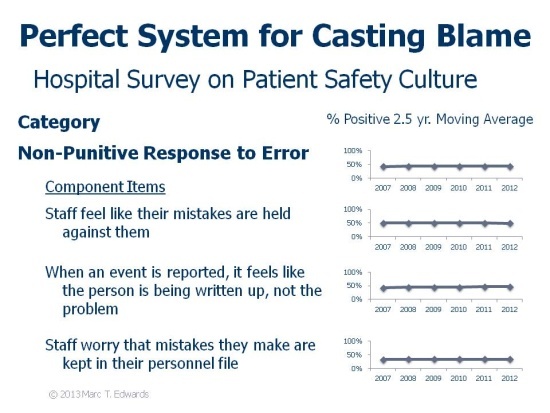 In other words, hospital culture encourages casting blame. While individuals who commit reckless acts with disregard regard patient safety must be held accountable to prevent mimicry and recurrence, we know that blame is a toxic inhibitor of the shared learning required to advance safety and high-reliability. CHPSO is an organization under the Hospital Quality Institute (HQI), an entity created to bring together quality improvement and patient safety efforts throughout California. HQI is seeking experienced staff to complete a team of quality professionals to share the HQI vision for patient safety and quality that will serve as a vehicle to harmonize the efforts and accomplishments; and in so doing, lead the nation in high quality, safe and reliable health care, resulting in greater value and better health. All opportunities are currently listed on the California Hospital Association website, or you can click the individual links below for specific postings. You can also read more about the Employment Benefits offered. Patient Safety Awareness Week is an annual education and awareness campaign for health care safety led by the National Patient Safety Foundation (NPSF). Each year, health care organizations internationally take part in the event by prominently displaying the NPSF campaign logo and promotional materials within their organizations, creating awareness in the community, and utilizing NPSF educational resources among hospital staff and patients. Visit the NPSF Patient Safety Awareness Week website for information, tools and materials to help your encourage organization through Patient Safety Awareness Week. Join Dr. Rory Jaffe in a discussion about alarm-related events that have been reported to CHPSO. Discuss The Joint Commission’s National Patient Safety Goal on clinical alarm safety and formation of a focus group to develop a statewide approach for development and dissemination of practice guidelines. This call is for members only. Registration is required and available at http://www.chpso.org/form/march-member-call. A CHPSO website member account is required. Registrants will receive an email March 7 with participation information. Participants registering on or after March 7 should contact CHPSO for participation information at (916) 552-2600. Copyright © 2014 CHPSO, all rights reserved.